William Cellini, center, departs the federal courthouse with unidentified family members after Judge James Zagel sentenced him to 366 days in prison and a $75,000 fine on Thursday in Chicago. CHICAGO -- A federal judge sentenced former Illinois powerbroker William Cellini to a year in prison Thursday for conspiring to shake down a movie producer, capping off the last trial to stem from the investigation of former Gov. Rod Blagojevich. Cellini, 77, was once known to political insiders as the "King of Clout" for his behind-the-scenes influence in state government. 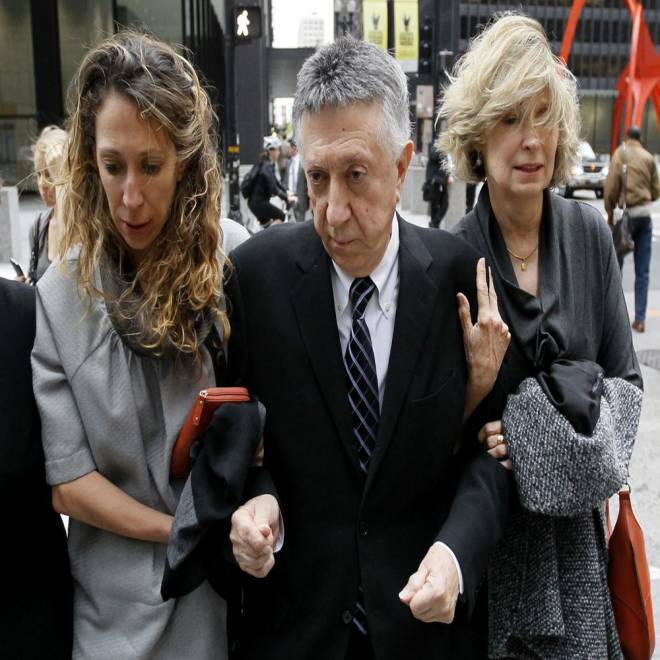 The multimillionaire businessman was convicted last year for his role in trying to get a $1.5 million campaign contribution for Blagojevich from Thomas Rosenberg, the Oscar-winning producer of "Million Dollar Baby," in exchange for state business. Judge James Zagel's sentence of one year and one day in prison was more than the probation defense attorneys sought but far less than the 6 ½- to eight years in prison recommended by prosecutors. Zagel said he took into account Cellini's poor health, including a heart attack he had in June. The judge also fined Cellini $75,000. "This was a series of extremely unwise decisions," Zagel said in sentencing Cellini. However, he also noted Cellini's acts of charity and said the 364 letters he received from Cellini supporters was more than he'd ever seen for anyone. Defense attorneys described Cellini's numerous health problems, including blood clots that he has had and is at risk for having in the future. "Mr. Cellini is in the twilight of his life," defense attorney Dan Webb told Zagel. Both sides asked the judge to take Cellini's health into account, but prosecutors said the conviction still warranted prison time because public officials were involved. Federal prosecutor Julie Porter said that Cellini's "crimes are very significant." "If you violate the public trust, you are going to jail. You are going to lose your liberty. This is a hard message, but it is a necessary message. … It does not matter if you are 27 or 77. It does not matter if you are rich or poor." Cellini took notes during the hearing and sat at times with his eyes closed. He read from a short statement, thanking friends and family for their support and telling the judge he didn't think he had long to live. He asked for probation but also said he took responsibility for his actions. "My family and I suffered greatly over these past five years," he said, referring to his legal problems. Members of his family sitting in the courtroom wiped tears. Cellini doesn't have to report to prison until Jan. 4, and the judge said he did that to give Cellini more time deal with his health problems. Cellini left court Thursday without speaking to reporters. His defense attorneys said they were disappointed in the sentence and were considering an appeal of his conviction. Cellini, a Springfield Republican, was appointed Illinois transportation secretary in the early 1970s. He then used his state connections to help earn tens of millions from real estate, casino and other ventures. Despite his wealth and influence, Cellini maintained a low profile and rarely spoke in public. It was his association with Blagojevich that drew him into legal peril. Former Illinois Gov. Rod Blagojevich gave a long, rambling speech a day before heading off to prison. NBC's Brian Williams reports. Cellini was one of more than a dozen people ensnared by the decade-long investigation into Blagojevich. The ousted governor was sentenced last year to 14 years in prison on corruption charges, including allegations that he sought to sell or trade an appointment to President Barack Obama's vacated Senate seat. The Chicago Democrat began serving his sentence at a federal prison in Colorado in March. Webb noted that Cellini wouldn't have pocketed any money from the shakedown of Rosenberg. Instead, prosecutors contend he saw it as a chance to further ingratiate himself with those in power. Acting U.S. Attorney Gary Shapiro called Cellini one of the "principal movers and shakers in the corruption" that "pervaded Springfield." Former Illinois Gov. Rod Blagojevich is on his way to a federal prison in Colorado where he will begin his 14-year sentence for corruption. To share his own prison-sentence experience, former Congressman from Ohio, Bob Ney, joins NOW and discusses what is in store for Blagojevich once he's in jail. But Shapiro said he doesn't expect this to be the end of corruption in Illinois. "I'd like to think we're never going to be prosecuting corrupt Illinois politicians again," Shapiro told reporters after the hearing. "But I'd be insane to make that prediction." The Chicago Tribune quoted Shapiro as saying Cellini's sentence should serve as a warning. "I think there is something to be said for incarceration for a person in Bill Cellini's position … In certain communities, sentences of incarceration do send messages, and this is a small community we are talking about — the sort of bipartisan cabal of Illinois, the people that are the behind-the-scenes folks that fuel the corruption and raise the money. Those people pay attention to things like this, and they pay attention when someone who is almost 78 goes to prison."